Engraving with etching by Domenico del Barbiere, 17.4 x 18.8 S (Zerner, Vienna). Inscribed on a small piece of curled paper at the upper left: . D . F .
Bartsch, XVI, 1818, 360, 9, as Barbiere after Rosso. Le Blanc, 1854-1888/90, I, 147, 10, as after Rosso. Herbet, III, 1899, 10, 9, as Barbiere after Rosso. 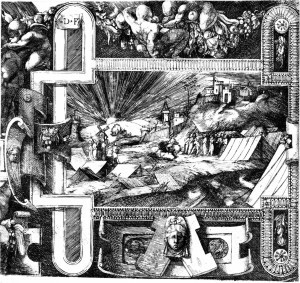 Both Bartsch and Herbet as an etching. Zerner, 1969, D.B.11 (Vienna), 1540-1545, as perhaps of Barbiere’s own design. COLLECTIONS: Paris, Ba XVI, It. Vienna. Kusenberg, 1931, as after Rosso. Zerner, in EdF, 1972, 279, no. 340, 280, ill. (Paris), and in Fontainebleau, 1973, I, 69, Fig. 36, II, 87, no. 340. Zerner, IB, 33, 1979, 265 (Vienna). Borea, 1980, 231, ill. (Paris), 280, no. 769, as of Barbiere’s design. Wardropper, 1985, 40, 62-64, Fig. 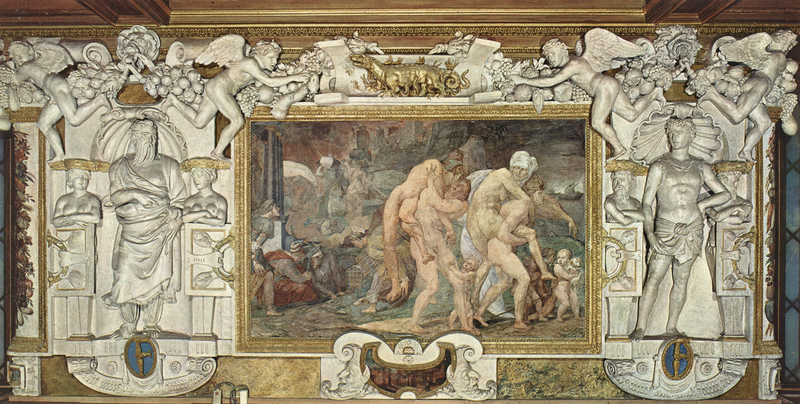 18, as Barbiere, late, and apparently of his design, with elements related to the Centaurs and Lapiths wall and the Loss of Perpetual Youth wall in the Gallery of Francis I.
Wardropper, in French Renaissance, 1994, 291-292, no. 68, Fig. (Paris, Ba 1, 16e siècle), as possibly begun as an etching by someone else and completed as an engraving by Barbiere, mid-1540s. The motifs of this cartouche remind one of Rosso’s decorative vocabulary in the Gallery of Francis I: the pattern on the bands is similar to that beneath the statues at either side of the Twins of Catania (Fig.P.22, V N a), the woman’s head is similar to those beneath the Combat of Centaurs and Lapiths (Fig.P.22, I S a), and the lion’s head is a frontal version of those above the Danaë (Fig.P.22, IV S a). 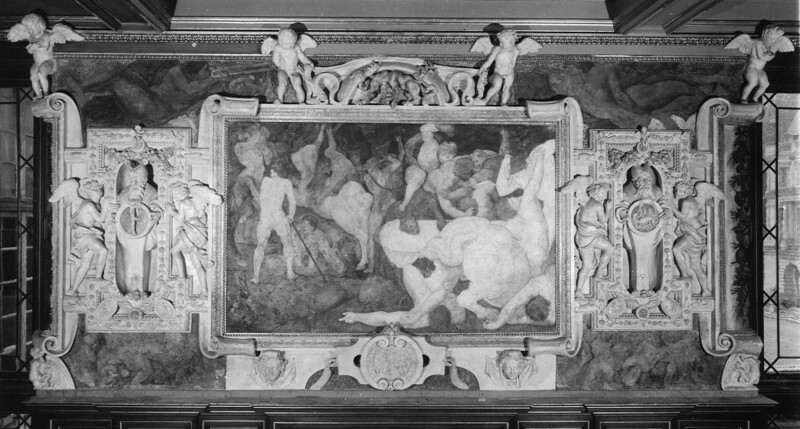 Putti playing among garlands can be found beneath the side panels of the Combat of Centaurs and Lapiths. Although the actual pattern that the bands make is not quite like any in the gallery, it has a certain relation to that of the Revenge of Nauplius wall (Fig.P.22, III N a), but there their surface is undecorated. 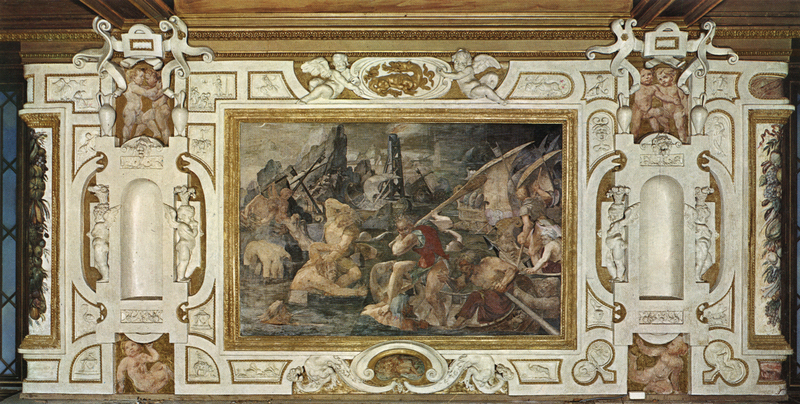 At the same time the overlapping of the motifs and especially the layering of the strapwork elements are not quite like anything in the gallery or like what we know of the frames planned for the lost Pavilion of Pomona (L.39). The whole configuration looks too crowded to be Rosso’s. That the whole engraving may rather be Barbiere’s invention is indicated by the character of the putti, whose musculature, big bald heads, and complex postures make them very similar to the Cupid in his Venus, Mars and Cupid engraving (RE.2). At the far left of the engraving is what appears to be part of a herm with a spiral base enclosed within strapwork. This seems to be a version of what appears in an etching of a satyr herm by Jean Mignon (Zerner, 1969, J.M.10). A rather reduced version of this herm appears in one of Du Cerceau’s Grands Cartouches, First Set (Herbet, IV, 1904, 300-301, IV, no. 10), where there also appears a putto in about the same posture leaning over the shoulder of the herm. Barbiere’s cartouche, with its remarkably radiant landscape, is unusual because it seems to be intentionally fragmentary and incomplete, as well as off-center. 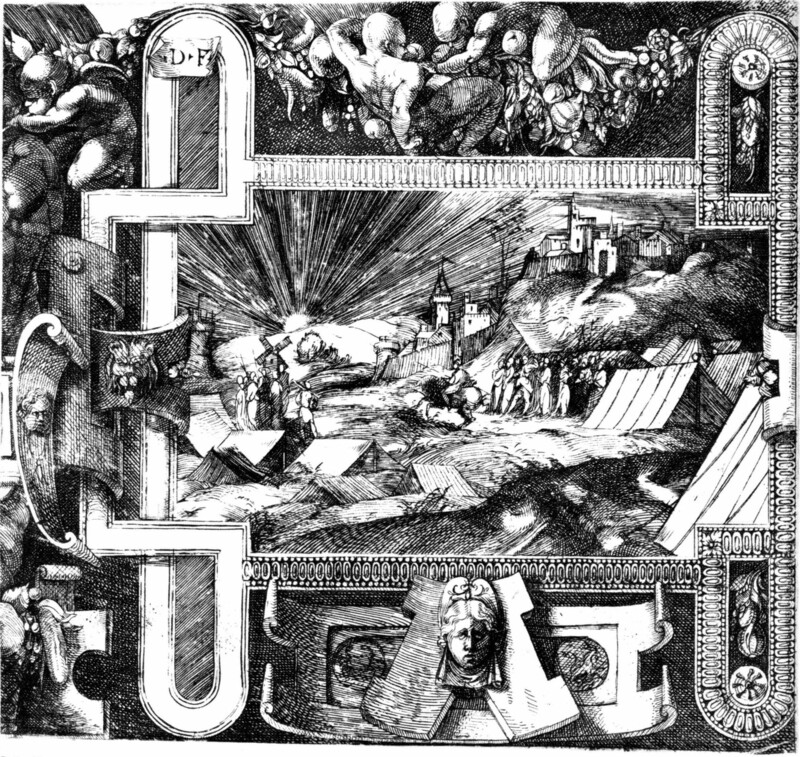 The cutting-off of the large motif at the left leaves it difficult to read. Part of the bands do not have their surface decoration, and the looped areas at the left are flatly shaded while their counterparts at the right have small garlands and rosettes. The whole print looks like part of a frieze and makes one wonder if it reflects a lost project, although Wardropper would doubt this.